Miranda's Mumbles, Murmurs and Mutterings: Happy Birthday Charlotte! It is exactly one year since the creation of Charlotte's Helix. It is exactly 6 months since Charlotte Bevan died. Today would have been Charlotte's 49th birthday. It is the first birthday that she will not have and that her family will have without her. You may remember my earlier blog posts about this amazing woman. If not, read here. Laura started the "I choose to give..." campaign off. 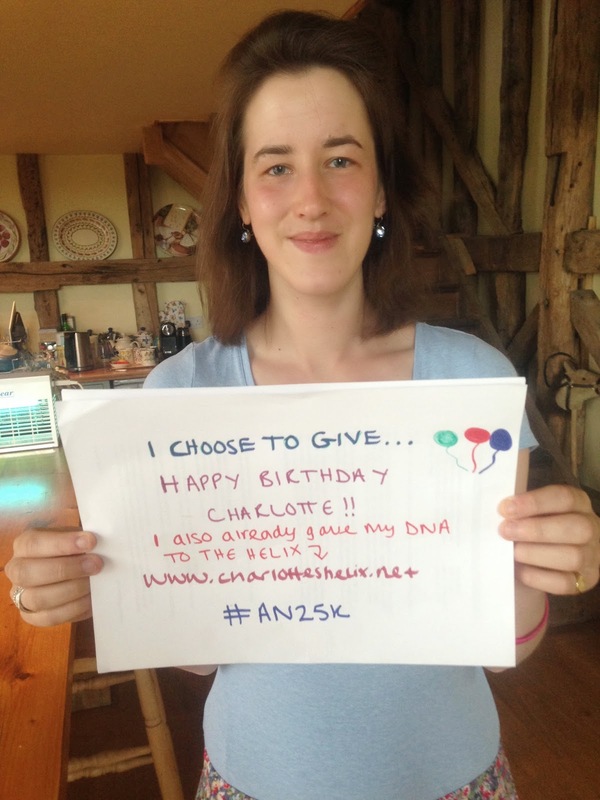 The idea is that you donate the money that you would have spent on a birthday card or present to Charlotte and give it to Charlotte's Helix instead. So much has happened in the last few days, weeks and months that I would have wanted Charlotte to know about. As well as my letter to an unknown soldier, I need to write Charlotte a letter as though I was filling her in on my news. I miss Charlotte a lot and think about her everyday. What can we do? Take Laura's advice. Please read about and support the Helix.